Back-to-Back-to-Back Final Fours is pretty SWEET! Freshman Kevin Love scored 19 points and grabbed 10 rebounds and was named the region's Most Outstanding Player. He averaged 21.8 points and 11 rebounds over four games. However, as well as Love played in the series, the most outstanding player for UCLA against Xavier on Saturday was junior forward Luc Richard Mbah Moute. Seemingly fully recovered from an injured left ankle, Mbah a Moute was his old self, active and disruptive on the defensive end while hustling on every offensive rebounding opportunity. He finished with 13 points and 13 rebounds - 7 on the offensive end, to spark the Bruins to victory. Learning its lesson from the Western Kentucky contest, UCLA played nearly a flawless 40 minute game in disposing of Xaiver, dominating on the defensive end and executing as planned on offense. The Bruins never trailed in the contest. Russell Westbrook set the tone of the game at the start when he stole a pass and glided down uncontested for a rousing slam dunk to open the scoring. Brimming with intensity and focus, UCLA did an excellent job rotating on defense, especially in the low post, and closing out on Xavier's perimeter shooters. The Bruins held a solid Musketeer team to just 24 halftime points on a meager 34% shooting. Darren Collison performed another one of his halftime closing acts by breaking down his defender and scoring on a tear-drop as time expired in the first half to extend UCLA's lead to nine, 33-24. Collison was one of four Bruins to finish in double figures, In addition to Love and Mbah a Moute, Collison scored 19 points on 7 of 12 shooting and Westbrook hit on 7 of 11 for 17 points. Overall, UCLA shot 53.8% from the field in the game. In the locker room, Bruin teammates and coaches reminded each other of what happened against Western Kentucky and the importance of playing the final twenty minutes as tough as the opening half. UCLA began the second half with a 18-6 run to put them up by 21 points, 51-30, capped off by a Darren Collison three-point jumper. On the other end, the Bruins were stepping into passing lanes and playing excellent defense as a single unit as the Musketeers found themselves throwing away passes and missing shots they'd normally might make if not for UCLA's intense defensive pressure. The Musketeers did mount one last comeback, cutting the lead to 12 points, but the Bruins learned its lesson from Thursday night. Instead of taking quick and hurried shots under pressure, the Bruins took their time and looked for good, smart shots while hitting their free throws to thwart any serious rally by Xavier. When Kevin Love hit his second three-pointer of the game with under eight minutes remaining, it helped push the UCLA lead back up to a commanding 20. UCLA shot 7 of 15 for 47% on three-pointers. Darren Collison was perfect, going 3 of 3 from beyond the arc. Prior to the game, UCLA Coach Ben Howland thought the game would be won on the boards. The Bruins outrebounded the Musketeers 34-26 with Mbah a Moute and Love's combined 23 caroms leading the way. With the Bruins' advancement to the next round, UCLA becomes the first team since the 2001 Michigan State Sprtans to go to 3 straight Final Fours. It also brings the school's total Final Four Appearances to 18 in its history. Although of course, the number 12 is the more important figure for UCLA. 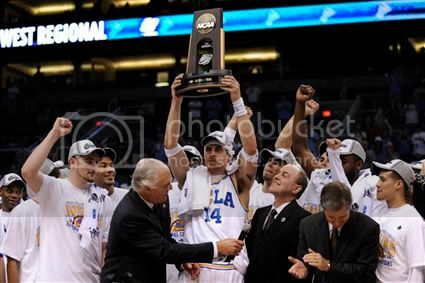 After three consecutive Final Fours, the Bruins will be looking to hang its 12th banner up at Pauley Pavilion. UCLA plays the winner of the match-up between Memphis and Texas in San Antonio next Saturday for a chance to play for the national championship. Great game!!! Why did Aboya only play 2 minutes? If we D like we did yesterday we have a great chance of going all the way! Mbah a Moute was stellar! Keefe has moved ahead of both Aboya and Mata in the rotation. Aboya has turned into a foul machine...even more so if thats possible. Still like his heart and hustle though. Memphis looked strong today against Texas. I think the main problem was a huge size and strength difference. UCLA matches up well with Memphis and I look forward to seeing Westbrook defend Rose. Can't wait 'till Saturday! Go Bruins! Memphis is bigger and has more depth than ucla in the backcourt and they are more or less of equal size and depth in the frontcourt. Collison-Rose is the key match-up in the game. Rose is 6"2, but plays like he is 6"4. If collison can make him work for his points like kansas did with stephen curry, or if collison has a great offensive game to neutralize what Rose is doing, a great advantage goes to ucla. I see collison and westbrook doing a lot of doubling on Rose. But if coach has to switch collison to either of the other two guards, both of whom are at least 6"5, either will eat collison for lunch. Big advantage to Memphis. If either of ucla guards or Shipp gets into foul trouble mbah a moute will see a lot of time at small forward meaning keefe will see plenty of time at the 4 spot. This is a plus for ucla, keefe will prove valuable. Also, if shipp continue's to do the other things like rebound, block shot's, get assist's, take to ball to the hole and play decent defense, it doesnt matter whether or not his shot is falling. My sense is that westbrook will have a great offensive game because he is the only ucla starter that hasnt had one yet in the tourney. Although logic suggest's that he will be too busy on the defensive to concentrate on offense, I'll go with my intuition on this one. The 2nd most important thing is if the refs call the ticky tacks. Love and westbrook are the only indepensible players ucla has (in this game) and Love knows how to play while in foul trouble. Westbrook would have trouble.For Memphis, if dorsey gets into foul trouble (because he is the only 'big' who can guard Love)or if either of Memphis' two big 6"6 guards fouls out, collison would then be guarded by someone his size and westbrook could then zero in on Rose, then Memphis would have little chance. Advantage to ucla if the refs DONT let them play. But either way the refs call it, the bottom line is this game has the potential to be a classic. Slight advantage to ucla because of their superior foul shooting and experience in final fours. Based on players wise, Memphis has the advantage. Position for position, they have the better player basically in just about every position except for the center spot. They also have more athletic players and bigger players which will create problems for UCLA. The game will all come down to how well Rose handle the double teams. If he can do so well, then most likely Memphis will win. UCLA has too many inconsistent players to make this a high scoring game. The game will have to be in the 50s or at most 60s if UCLA wants to win. If I was Memphis and Collison was guarding Rose, I would not screen for Rose but simply do a clear out and let it go one on one. Rose is taller and much bigger and stronger than Collison. If Rose and Memphis is happy playing the perimeter game, it would fall into UCLA's advantage but I really doubt that will happen. It will be either Rose or Douglas Roberts going isolation since they will both have a mismatch on them. In any case, the Bruins will have to rely that teams dont shoot well from the outside and if they do, its over basically. Bruin players hustle and play good (not well) defense but just do not have the athleticism to score tons of points. I have said all season long that UCLA relies much offense from their defense by creating turnovers. This is all fine if the other team is doing so, but if the other team doesnt turn the ball over too much, it is always a huge problem for the Bruins. There were many spurts this season where the other team turn the ball over so many times yet UCLA was only up a few points. The Bruins will have to come out very focus with players needing to hit their outside shots. Texas who gave the Bruins problem and a loss got destroyed by Memphis. This Memphis team is dangerous with speed, shooting, scoring, bigs, and low turnovers. The plus side on UCLA is the experience of going this far into the tournament. The Bruins will need to get into their offense early and not have Collison dribbling and using up half of the shot clock to even try and get the offense set going. on top of this, they need to slow the game down like Washington State and force Memphis to play longer defense than they want to. Make Memphis lose patience and energy from playing long stretches on D.
Lastly, the Bruins needs to stay out of foul trouble since they do not have a deep bench and refuse to use any other kinds of defense other than man to man. Fast break when there is an obvious advantage, but slow this game down to 1 position each to try and negate Memphis athleticism and rely on UCLA experience. Oh ya Shipp is going need to hit his shots or you can count on Douglas Roberts to sag down against him and make the offense harder to run. There is no such thing as someone on the floor not needing to hit their open shots from the perimeter unless you are a big man. If you dont hit your shots, it makes your offense harder and your opponents defense easier to play. Westbrook and Shipp will need to hit their outside shots. I have said all year long that all the Bruin players need to work on midrange jumpers and this will be true from here on out. Oh by the way, all those dunks and lob dunks by Xavier against UCLA last game even though Bruins won has got to stop. You get exposed like that and it will make your day very difficult against a team that can score very well. Great analysis by DB. However, one point I'd like to bring forward about Shipp vs. Memphis. Josh is totally dependent upon UCLA's offensive sets to get him his shots since he cannot create his own shot. This is the same option that Dijon Thompson and Afflalo used to score many points for Howland's Bruins. Rarely has the UCLA set offense resulted in Shipp getting open looks for the last 4-6 weeks. This Memphis team is longer and quicker than any team UCLA has faced so far this year, therefore I don't see Shipp getting any good looks. Therefore I don't see him taking more than 2-3 shots. Therefore I don't think his shooting will matter in this game. After UCLA exhausts their east-west offensive motion to try to get Josh a good look, they use the high screen with Love or Mata-Real or Keefe or Aboya to allow Collison to create. Texas does the same thing with Augustin, and he got nothing vs. Memphis. Therefore I don't think Collison will get much. Even against much lesser defensive teams than Memphis, UCLA's offense often sputtered terribly late in the shot clock with Collison trying to create off of this high screen. Many times this resulted in terrible shots. Therefore I think these two primary options for UCLA will be basically bankrupt. That leaves only 2 things: 1) Pounding it down low into Love 2) Having Westbrook create a bit. Mbah a Moute and/or Keefe will find themselves with 14-16 open jump shots. They gotta feel confident to take them, and then hit them. The offensive glass will be another key part of this game. If Love and LRMM can do well here, and they should be able to, UCLA can win. There are a few more wrinkles Howland has to his offensive sets. I think we will see them Saturday. Most of this is mis-direction stuff that results in good opportunities to get the ball in low to Love. If Memphis scores more than 67 points, UCLA cannot win. It's all about tempo, which UCLA must control. DB, a little long to hold our attention (because we are mostly self-serving and want to hear ourselves with our ideals) but you most definitely make a lot of good, valid points! Glad I read all the way through. Let's just hope and pray for the Bruins intangible ability to win pulls us through two more times! Yes I agree this game will have to be all about pounding it down to Love early and often which both teams I am sure will know. The problem is the inevitability of Memphis sagging and doubling down which will force UCLA to have to hit outside shots. I see Memphis sagging down and testing Bruins outside shooting. I would not be surprised if Shipp's man is used to double down since it is most likely CDR. He is tall enough to make it worthwhile to double team with against Love. In any case, I am going to bet certain Bruins will get open shots here and there as they double down on Love. You double down and try to negate the Love as much as possible and make this a perimeter game shootout which the Bruins WILL have to step up regardless who it may be. With Collison who is probably the most consistent of the Bruins outside shooter, it might be good to have Westbrook play Point and have Collison focus more on shooting when Memphis double down and they will. If they dont double down, this means they are doing a good job against Love one on one which means big trouble for UCLA. Wishful thinking, but miracles do happen! with all due respect to a fellow bruin fan, i must say, db, although i said shipp did not have to hit his outside jumpers for him to be effective, i did not say that shipp did not have to score. He actually is quite good going to the hole. And should do it more often.